​​​ ​DALLAS – More than a dozen Holocaust survivors broke ground in downtown Dallas on a greatly expanded museum dedicated to their ordeal and a simple proposition. 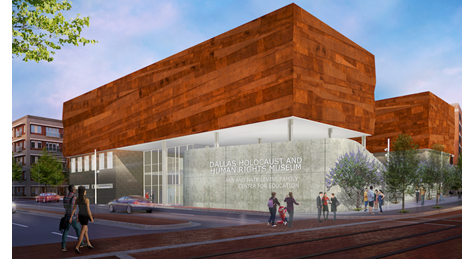 Led by local Holocaust survivors and the Mayor of Dallas, the Dallas Holocaust Museum broke ground on a new 51,000-sf museum in downtown. The new museum, located at 300 N. Houston St. in Dallas' historic West End district, will quadruple its current size, accommodate more than double the number of current visitors. Scheduled to open in the summer 2019, the new state-of-the-art facility will be called the Dallas Holocaust and Human Rights Museum. Also see the Dallas Morning News.